Barulatai son of Qaci'u was the founder of the Mongol Clan Barulas. There were several men of Clan Barulas who were instrumental in the selection of Temujin as Qan. As Qan we know Temujin as Cinggis Qahan (Ghengis Khan) the single greatest conqueror in the history of warfare. As clan leaders in the Mongol Horde that predate Cinggis Qahan as Qan the Barulas leaders were among the elite of the most elite group that conquered most of the known world. After the death of Cinggis Qahan clan Barulas went with the second son of the Qan, Ca'adai (Chagatai). For some odd reason the Horde of Ca'adai is not usually counted as Mongols and are instead called Chagatai Turks. They were as much Mongols as any other Mongol but I will use the familiar usage. The Chagatai Turks ruled Transoxiana present day Turkmenistan, Uzbekistan, and Afghanistan. The control of the Chagatai Horde staid in the hands of cingissid khans that is direct descendents of Cinggis Qan through his son Ca'adai until the reign (1346-63) of Tughlug Timur the last independent Chagatai Khan in Transoxiana. Timur Barulas a Barulas prince was born in Kesh (Shahr-i-Sabz, Uzbekistan). Tughlug Timur came under increasing pressure from the Moghols of Mogholistan and by 1363 he was weakened enough that Timur Barulas expelled Khan Tughlug Timur and set up a puppet Cingissid Khan. This marked the conversion of the Chagatai Turks to the Timurid or Timuri. The next major milestone for the Timuri was the collapse of the Timurid Dynasty. The Shaybanid Uzbeks were able to drive the Timurid Ruler Badi'Uzman Mirza out of Herat, bringing to an end the Timurid dynasty. Grousset, Empire. Page 465. The end of the Timurid dynasty certainly did not mean the end of the Timuri people. Over the next few years the situation stabilized with the Shaybanid Uzbeks taking Turkmenistan and Uzbekistan, a minor Timurid prince Babur turned ignoble defeat into first the Kingdom of Kabul and then the beginnings of the Mughal Empire in India. The Herat region was divided along the Firoz Kohe (ridge) with every thing north and east controlled by the Uzbeks and everything from Herat through what is now known as Khorasan falling under the sway of the Safavid Turkmen. The people we now know as the Timuri are the descendents of the people who went with the Safavi. In the very beginning of the 17th century Shah Abbas the Great created two of the final Kizilbash tribal federations both in the eastern end of his Empire. The first group were the Popalzai tribe the founding tribe of Durrani Pashtuns, who I will deal with elsewhere. They were given land between Herat and Kandahar. The Turkic tribes of the Herat area were organized as the Chahar Aimaq. Since the Chahar Aimaq confederation ceased to exist years ago it is easiest to see them as a language group. The descendents of the people who belonged to the Confederation are the ones who are the native Chahar Aimaq speakers today. Structure: Asymmetrical knot open to the left. 8 knots per horizontal inch and 9 knots per vertical inch. 72 per square inch (1116 per square decimeter). Warp: 2 ply tan wool. Weft: 2 shots olive green wool. Handle: Soft wool, light, durable. 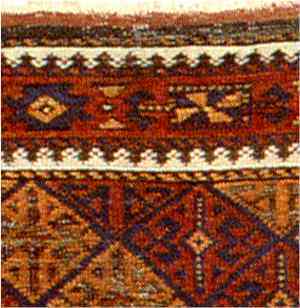 Similar Rugs: Timuri rugs are very much in the Baluch Group. 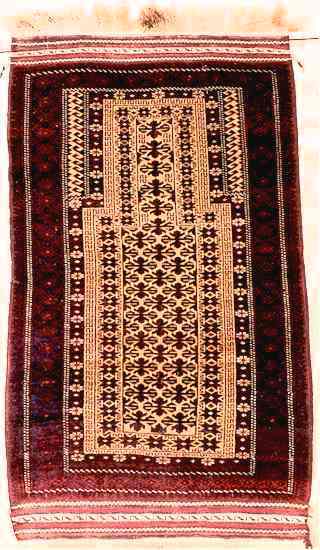 Among the Baluch the old Timuri rugs tend to be thin rugs with a flat back. 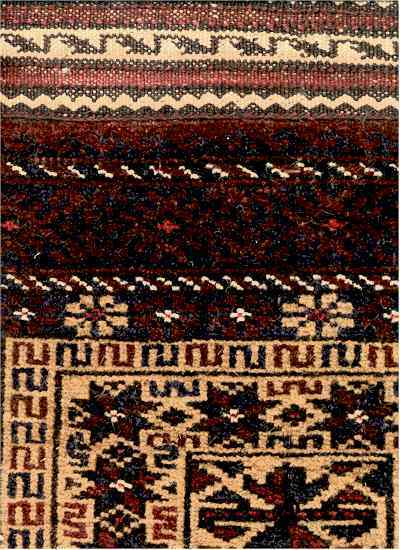 Timuri rugs frequently use a 2 cord double-looped selvage in goat hair. For an example of a similar selvage see Marla Mallett's Woven Structures 15:66 and 15:67. 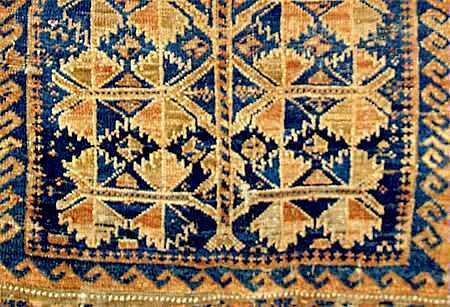 Many Baluch type rugs use a 2 cord double-looped selvage but with the Timuri rugs the selvages tend to be precisely and neatly braided. Description: The field composition consists of repeating trees-of-life displayed across a dark blue ground. There are two principal tree constructs with lesser floral and tree-like ornaments as filler motifs. As Robert Pittenger observed in the article cited below these rugs are much easier to enjoy than to name the tribe that wove them. Pittenger designates this example as a Group "A" Baluch/Timuri. Condition: Good. There is wear to the selvedges, some minor areas of wear, and some creases at the base. Otherwise, the pile is full. The handle is very supple, almost clothe-like. 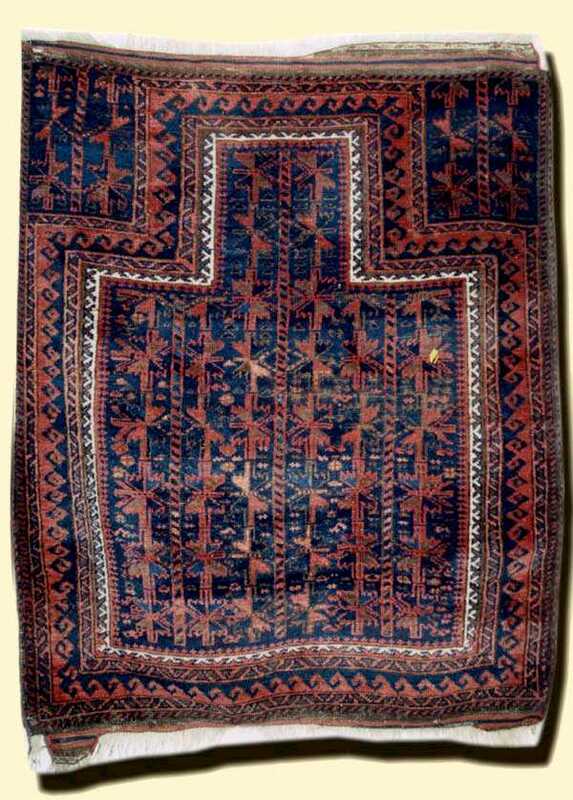 This rug appears to represent what writer/collector Robert Pittenger classifies as a Group A blue ground prayer rug. Pittenger opines that these examples are probably older than comparable blue ground examples and are more likely to be Timuri in origin. The wefts of this tree-of-life prayer rug are tan or light brown. The selvedges are worn and substantially re-cast. However, portions of the original have survived. The original is in a blue/reddish-brown checkerboard design. Dimensions, although not square, are not overly rectangular. The surviving flat woven end panels, top and bottom, employ a weft-float technique. Condition: Fair. There are areas of wear and/or oxidation. There is a patch repair (2 x 3 cm) in the border. There is blue backing on a 5 x 6 cm hole in field. The wool pile is extremely soft. The handle of the rug is very supple. Sides: most is not original and has been re-cast in light brown wool or is in need ot repair. there are, however, areas of apparent original selvedge woven "checkboard" style in dark blue and brown. Ends: approximately 2 inches of the original brocaded ends intact and in good state of preservation. 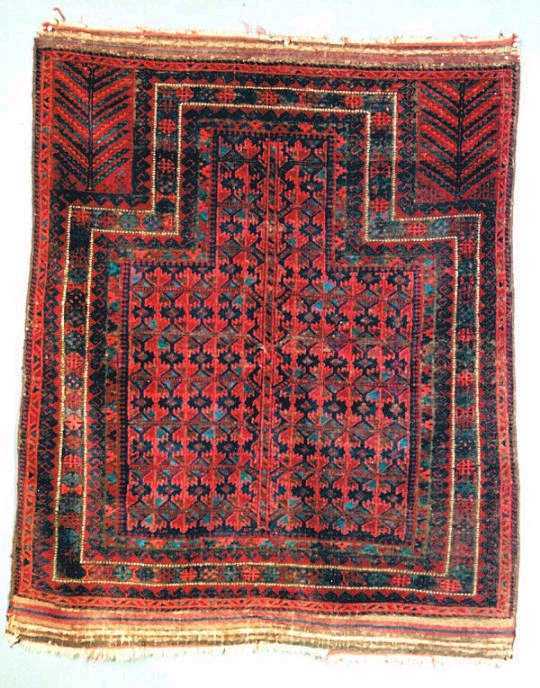 This Timuri prayer rug was woven about 1850 in Afghanistan and is in very good condition. 4x5. 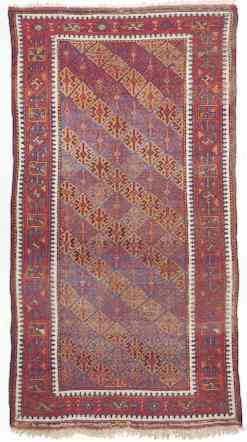 "London dealers Marcuson & Hall have tended to concentrate on textiles at their recent shows, but two knotted rugs on their booth stood out. The first was a dark and moody small Timuri main carpet with wonderfully soft wool. The field of this piece featured a broad spectrum of Timuri design features, which seemed to float on an inky black night sky. This tribal weaver's handling of scale and ornamentation showed a respect for each individual motif on this limited canvas." 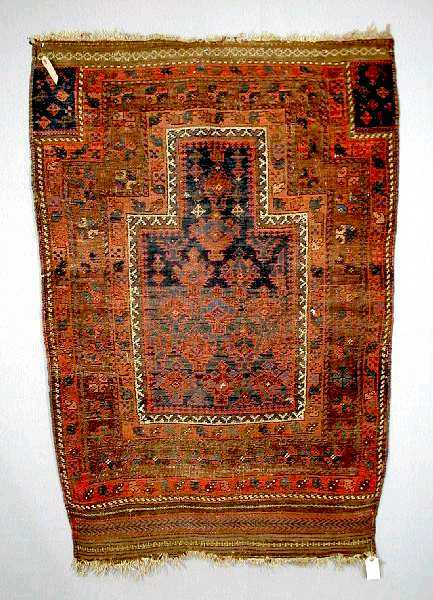 Rug mid-19th C 5ft. 10 in. by 3 ft. 1 in. 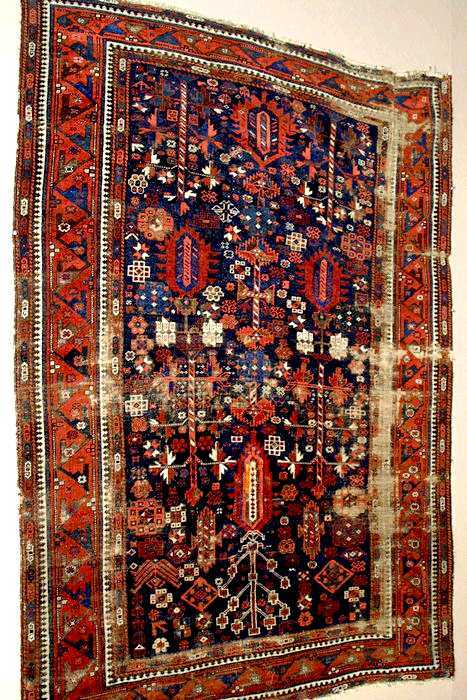 Notes: This appears to be the kind of rug that I would call Persian Timuri. 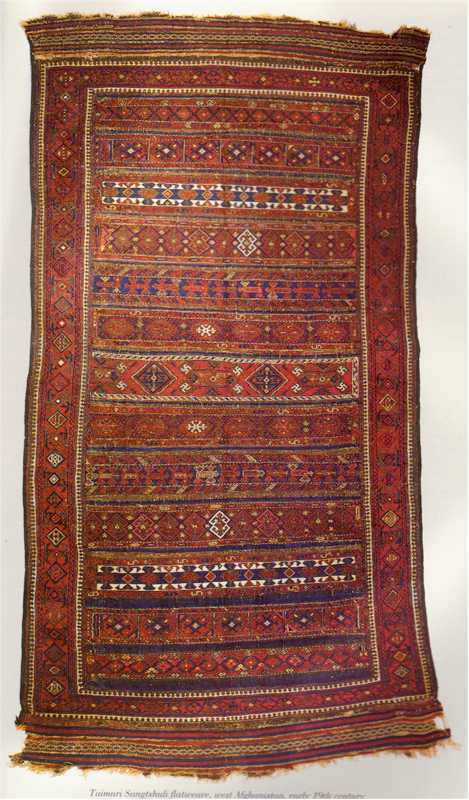 The field medallion, the main border, the guard border, and the minor guard border are ones that I see regularly in rugs I categorize as Timuri. The color palette and the 4 cord selvage cause me to think Persian rather than Afghan. I spotted this rug was in an ad for Brian MacDonald Samarkand Galleries in Hali magazine September/October 1999 Issue 106 page 125. Ever since I saw one of these I was struck by the power of the design. 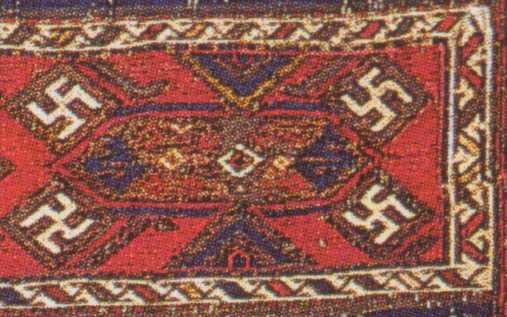 Actually the swastikas are a minor part of the design but I decided to do an article of the swastikas in rugs, more interesting to my studies in the device below that I use as a Marker for Timuri. 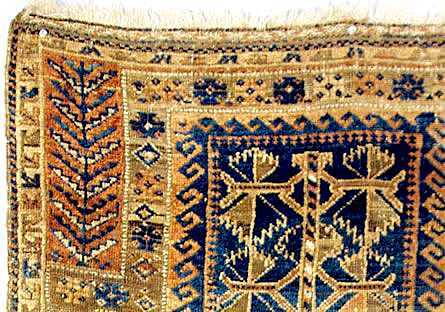 It is an outstanding rug combining features usually only seen in the best of the very old rugs. From the wool wefts which are very rare to the unusual design. I cannot get the pictures to show you the very subtle colors in the border. 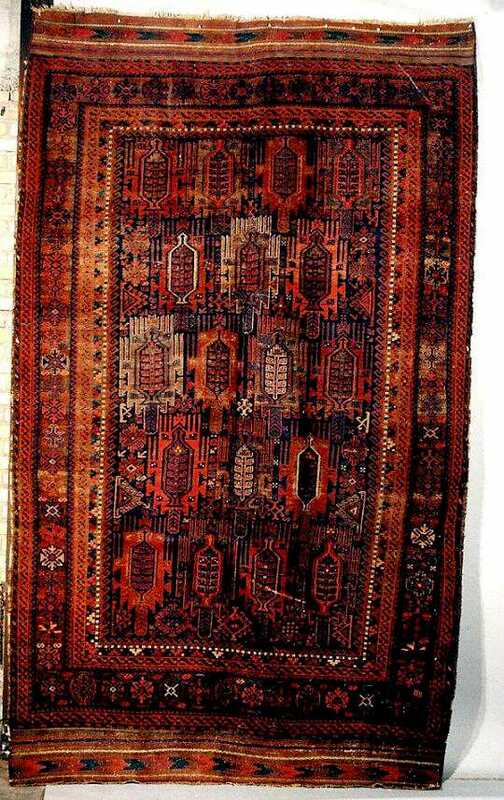 I was going to just call this rug Chahar Aymaq but I recognize the work as Timuri, The Timuri is a dialect of the Chahar Aymaq language but as weavers only the Timuri tie their selvage this precisely. One new thing for me is that it is asymmetrically knotted except for the outer 5 rows of knots are symmetrically knotted. 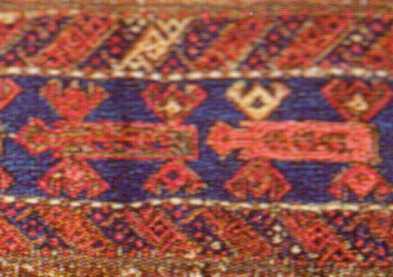 This is normally only seen in old Tekke Turkmen rugs. 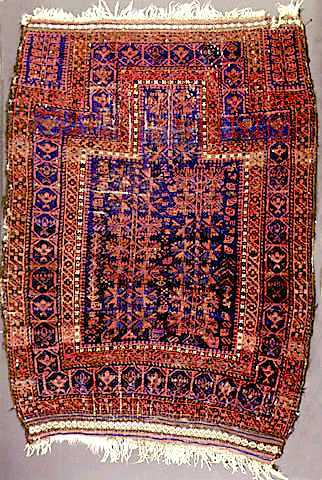 Timuri Prayer Rug, Northwest Afghanistan. Twentieth century. Intact full pile rug in unused condition. 2 foot 9 inch by 5 foot 2 inch. (not including fringe). Structure: Asymmetrical knot open to the left except for the outer 5 rows each side which are symmetrically knotted. 12 knots per horizontal inch and 6.5 knots per vertical inch. 78 per square inch (1209 per square decimeter). Flat back. Warp: 2 ply Wool, tan. 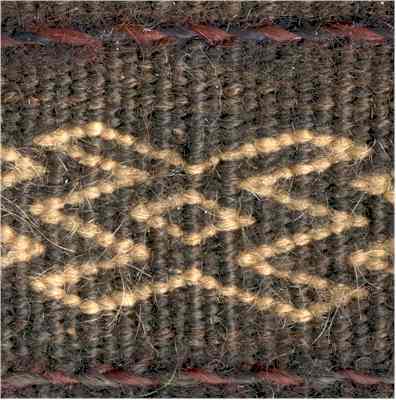 Ends: Top: 4.5 inch plain-weave, twinning, and weft replacement tapestry, and warp fringe. Bottom: 5 inch plain-weave, twinning, and weft replacement tapestry, and warp fringe. Selvages: Double looped on two warp units. Dark brown goat hair. 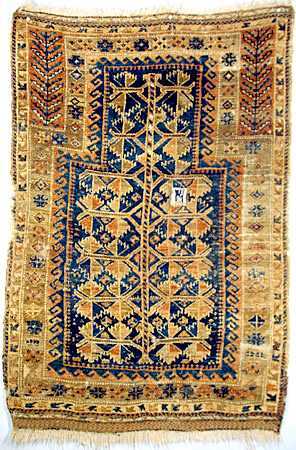 The selvage is very neat and precise as seen in pre-World War 1 Timuri rugs. Further Notes: Excellent condition. The skirts are exceptional. 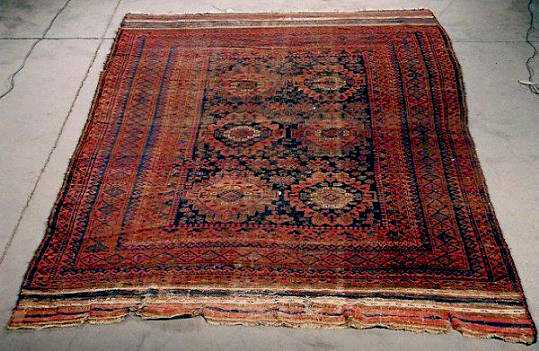 The selvage extremely good, this is a much better than average Baluch type rug. North east Persia or west Afghanistan, late 19th century. 4ft.6in. x 3ft.1in. 1.37m. x 0.94m. Slight wear in places.